In 2002, I was an assistant principal at an elementary school on the south side of Indianapolis. 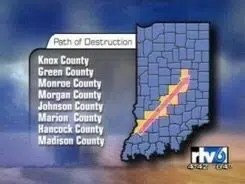 On September 20, a beautiful fall day ended with an EF3 tornado that raged through 100 miles of Indiana cities and countryside. At approximately 2:00pm, the tornado clipped a middle school to the west of us, and then came to within 25-50 yards of our school before decimating the surrounding neighborhood. No one in the building was hurt, although quite a few became terrified when the twister tore off several ventilator covers on our roof, causing water to cascade into the hallways. We lost power, and were forced to stay in the building until around 9:00pm, when first responders arrived with a convoy of buses to take the children to a reunification point. Judy Livingston was the principal, and she was masterful that day. She made sure the kids had access to the restrooms, had snacks brought to each classroom, and through it all maintained accountability of her children and staff, all while maintaining a calm aura of leadership that carried us through the incident. I learned a lot from her that day. The biggest lesson I learned that day was that technology is great, until it isn’t. We learned from our local experiences on 9/11, just over a year before, that communications are critical during an incident. We had purchased quite a few radios, and had incorporated them into our culture. Leading up to the tornado near-miss, we used our radios to communicate with the central office, and I tracked the storms progress over the Internet. For about an hour, the radios continued to work. Communications with the central office were hampered by undisciplined radio traffic, but Judy was able to pass along instructions to the teachers. However, with the power out, we were unable to recharge the radios, and soon they were useless. Cell phones were out, as was the phone system. Our school had returned to a “natural” state. With the power out, there were no lights in the building, and soon nearly 1,000 children needed to go to the bathroom, which were dark. Flashlights ran down in a couple of hours, so when the sun went down, it got very dark. How were we able to respond so well? Judy had a “caveman plan”. Judy knew that there would come a time when all of the great technology we had would be rendered useless due to loss of power. She planned accordingly. Knowing that the caveman had survived without power, she planned to be able to operate just like cave men and women would if necessary. She had 6-8 children from the oldest grade in the office, and used them as runners to send messages to the teachers through out the building. She assigned them a section of the school so they would be familiar with that part of the school, even in the dark. Her most common messages were, “How are you and the kids?” and “How many do you have?” She wanted to remind them they weren’t alone, and that they needed to maintain accountability. plenty of replacement batteries. Check them every year for usability. database will not protect you if you send a child away with the wrong adult. Get your planning team together and see if you can add to this list. Make sure it will work for you. Like any plan, practice it. Learn from mistakes made, and be ready when the power goes out. Steve Satterly is a school safety practitioner in Central Indiana. He is a researcher and analyst with Safe Havens International, and a co-author of Staying Alive: How to Act Fast and Survive Deadly Encounters, published by Barron’s Educational Series.